Audio For Drinking: "I could never leave and come to comfort you"
"I could never leave and come to comfort you"
An early frontrunner for my song of the year, "My Punishment for Fighting" is on the the new album from North Carolina duo The Rosebuds. That album, Night of the Furies, is a much different beast than their previous and should illicit some arguments about which is the truer breakthrough for the pair. Whereas Birds Make Good Neighbors was downright cynical in its alignment with the Rosebuds peppy power-pop roots, this one has traveled further down that road in the Southern evening, taking a turn to something topically darker. Even at it's most optimistic, the sentiments of love seem fragile as ever and so it's all too appropriate that the group tosses aside the sharp twang found on Birds for a throwback, synth-heavy pop sound that owes more to the early eighties. Thanks to the superior song-writing though, Furies won't be mistaken for the post-new wave electro-pop clones out there. While the mood is far more seductive and enchanting here, I'm not ready to definitively declare which album was better yet. I have spoke to a lot of people that feel betrayed by this album, but of course it's simultaneously true that you can't expect a band to release the same record over and over and that people sometimes connect to an album on such an intimate level that change can and will obscure something good. I was able to catch the tour following this album, where they seamlessly interchanged songs from previous works, but the live presentation also made tunes like "My Punishment..." that much more sirenic in comparison. 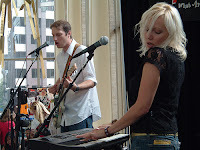 The Rosebuds- download "My Punishment for Fighting"